New imaging and modelling technologies are in the process of profoundly transforming the field of plant science, according to a recent report. These tools are providing scientists the capability to peer inside the leaf with a clarity and resolution that were inconceivable a generation ago. A team of Australian and international scientists, in a recently published article, demonstrated how three-dimensional (3D) imaging can now reproduce the inner reality of the leaf, including the dynamic carbon and water exchange processes. A Professor from the School of Life and Environmental Sciences at the University of Sydney explained the huge potential that embracing 3D complexity can have in improving the understanding of leaves at multiple levels of biological organisation. This includes harnessing the knowledge to improve the photosynthetic performance of crops. It is similar to having the ability to walk inside the leaf, instead of looking at it squashed from a two- dimensional point of view. The co-author of the paper is a Professor at the Australian National University who received the Kyoto Prize in 2017 and the Prime Minister’s Prize for Science in 2015 in recognition for his work in developing the understanding of photosynthesis. The Professor from the Research School of Biology at the Australian National University explained that although leaves and plant cells are three dimensional, plant biologists use highly simplified 1D or 2D models. Thus, the biologists have evaded the difficult but confounding and beautiful 3D reality. The leaf is an amazingly complex landscape, where water and gases flow in many directions depending on variables such as temperature, light quality and wind. 3D images give people an understanding of what is really happening. These technologies make it possible to answer very interesting questions, some of which have eluded scientists for many years. The process of creating the images involves the use of biological specimens, by integrating 2D leaf measurements to create 3D volumes and surfaces. 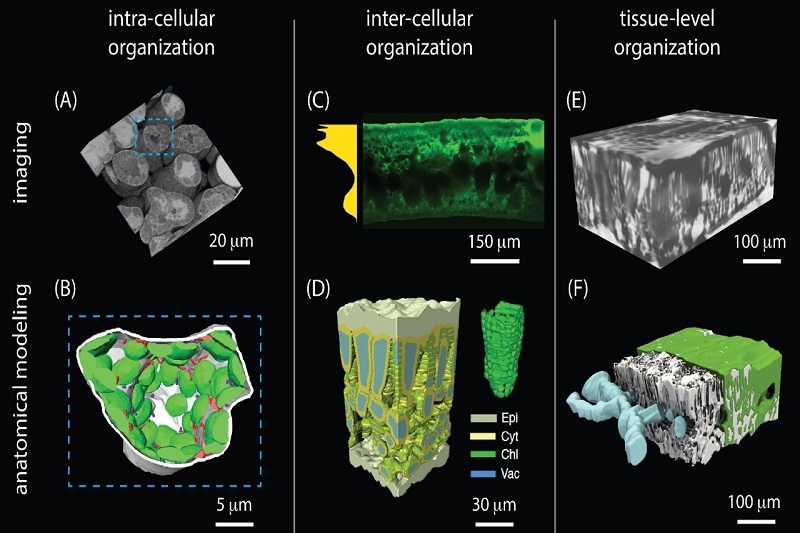 The 3D representation enables an anatomically correct basis for modelling and biophysical simulations to provide a dynamic view of the processes inside plant cells and tissues. Adopting a 3D approach is not only critical for testing when dimensionality reduction is reliable and accurate, but also promises to deliver insights on several interesting plant processes. These include the fundamental processes of leaf CO 2 and H 2O transport and exchange; the translation of leaf anatomical diversity to functional diversity; and fine-scale CO 2 and H 2O exchange processes in broader-scale models. The scientists predict that with the use of a collaborative approach, they will be able to answer, within the next decade, outstanding questions about how the 3D special arrangement of organelles, cells and tissues affects photosynthesis and transpiration.